Some limits of Lake Trout are still being taken North, and straight out of the harbor in the 30 to 90 foot of water areas, using dodgers with the spin and glows, or clean spoons down 35 to 85 feet. Best colors have been the froggy dodgers, with bright yellow with green and orange colored spin and glows, and green, blue, and perch colored spoons. Some Salmon and Steelhead are being taken Straight out and North of the harbor fishing in 35 to 85 feet of water fishing 30 to 55 feet down using spoons. Best colors have been orange, green, blue, and the yellow tail. Try some 3, 5, 10 color lead lines on the Offshore Boards as well. 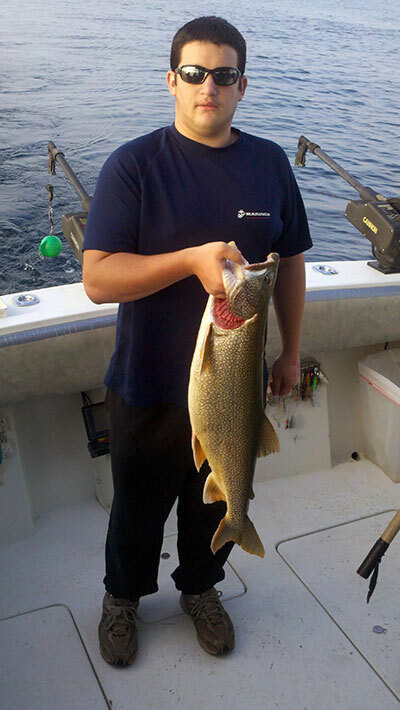 Some Lake Trout are being taken North of the harbor in the 100 to 120 foot of water areas. Try some dodgers with spin and glows right down on the bottom for best results. Spoons off the downriggers as well, but dig the bottom with the dodgers for best results. 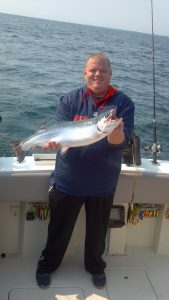 Some Steelhead are being taken around the color lines using bright colored spoons off of the boards with lead lines. You might want to try casting some small body baits off the wall for some walleye in the late evening hours. Perch colors should work good for you. Some have been taken out in 90 foot of water on hot and Tots and small spoons. A few Perch have been being taken inside the harbor, they are on the small side, but they will entertain the kids and adults too. Next year I think we might have some nice size perch to fish for if the winter is nice to us.